I specialise in engraved glass and kiln formed glass, often combining the two. My work is inspired by the beauty and power of wildlife and natural forms and by the myths and legends that surround them. I have been working with engraved glass since 1992 and with kiln formed glass since 2001. 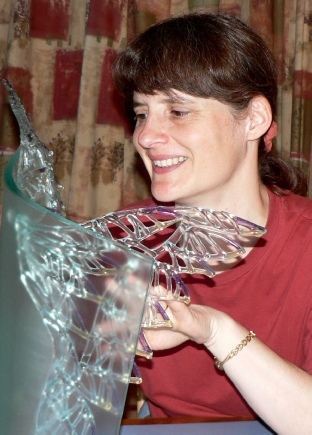 After training as a glass engraver at West Dean College and Eastleigh College, I graduated in glass design from Wolverhampton University and the International Glass Centre, Brierley Hill. My vessels, sculptures and wall pieces are regularly featured in exhibitions and galleries around the country and I also work to commission. My aim is to create work that is exciting, unusual and a delight to own. I am a member of the Gloucestershire Guild of Craftsmen and the Society of Designer Craftsmen and a Fellow of the Guild of Glass Engravers. I work from my studio in the lovely Slad Valley in Gloucestershire.